Avenir Global Fund commentary for the third quarter ended September 30, 2018. The Avenir Global Fund (the “Fund”) increased 6.6%, net of fees, for the September quarter, and has delivered 18.4% over the past 12-months. The MSCI ACWI index (in AUD) returned 6.5% for the June 2018 quarter while the S&P 500 returned 7.7%2. During the quarter, the US economy and equity markets continued to go from strength-to-strength. The US economy continues growing strongly, expanding 4.2% for the June quarter, its fastest pace for four years. Job growth continues to be robust with the unemployment rate at a 49-year low of 3.7% in September. Corporate tax rates have been cut materially, boosting earnings, and regulations that businesses find burdensome and expensive continue to be unwound. Companies reported very strong earnings growth for the second quarter with 80% of companies in the S&P 500 announcing earnings that beat estimates, the highest such recording measured by FactSet since 2008. At the same time, while Federal Reserve Chairman, Jerome Powell has stated his intention to move interest rates upwards in a more purposeful manner, they remain low and credit is still readily available. Business and consumer confidence remain high and the ten-year bull market showed ongoing strength during the quarter. Outside of the US, things have been different during much of this year. European markets showed modest rises over the quarter amidst solid corporate earnings offset by concerns about slowing economic growth. Emerging market equities and currencies continued to see pronounced weakness, particularly countries such as Argentina and Turkey that have high levels of external and foreign-currency denominated debt. As the long-awaited increase in US interest rates has started to take hold (and finally be noticed), emerging country equity and currency markets have come under increasing pressure which has been exacerbated by trade friction and concerns of slowing economic growth in China. Emerging market stocks showed negative to flat results during the third quarter. The MSCI Emerging Markets Index fell 1.5% for the quarter putting its year-to-date loss at 8.2%. Chinese stocks continued to slide, along with the Renmimbi, as mounting concerns about Chinese growth and the uncertainty brought about by the trade dispute with the US hurt sentiment. Chinese tech heavyweights such as Alibaba, Tencent and others weighed on index returns, having fallen heavily due to declining margins and the potential for slowing growth due, in part, to regulatory headwinds. The MSCI All China index fell 7.2% for the quarter taking year-to-date losses to 14% (China A-shares are down 21% YTD). Other emerging markets, such as India, have also seen heavy falls particularly in small-cap and mid-cap companies, after strong returns in 2017. 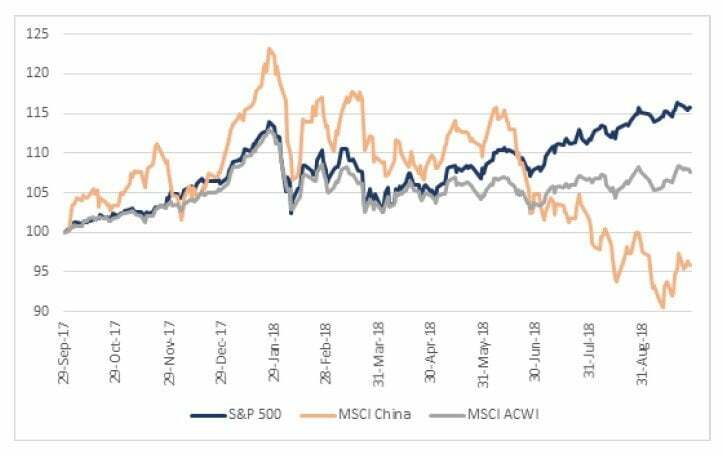 The chart below (through September) shows the divergent returns of the S&P 500, MSCI China and MSCI All Country World Index. Avenir has been largely protected from the turmoil in emerging markets due to our largest exposure being in the US. Despite elevated US equity market prices, the opportunity set remains rich and the companies we currently own with US exposure remain attractively priced. Given the marked divergence in the fortunes of the US and emerging markets over the past 12 months, we are starting to turn our attention increasingly to opportunities in the more beaten down parts of the world. In the December quarter, members of the team will be visiting Hong Kong/China as part of this effort. As always, our focus will be on maximizing long term returns, while controlling risk, by investing only in high quality businesses that we can buy at attractive prices, not by trying to predict short term movements in equity markets. The Fund made one new investment in the quarter, the Canadian listed company, ECN Capital (TO:ECN). The company is a recent spin-off from Element Financial (another Canadian listed entity) and has undergone a fundamental transformation that we believe is not yet fully understood by the market. The company has historically been an asset heavy aviation and rail leasing company but has now substantially transitioned to an asset light business services company through the divestiture of over $6 billion worth of leasing assets and the acquisition of three high return and fast growing business services companies. The investment downside is protected by the value of the remaining leasing assets, which will gradually be sold, and the upside is provided by the high growth business services businesses which have been acquired at attractive prices. We have been able to ‘create’ ownership of these fast growth business services businesses at an attractive price of roughly 5x forward P/E once the value of the remaining aviation and rail leasing assets is netted-off our purchase price. A very close peer to the ECN services businesses, Greensky (NASDAQ:GSKY), undertook an initial public offering of shares in the US in May 2018 providing a useful price comparison. Greensky was listed at $23 per share, equivalent to a 28x forward P/E. While Greensky has since declined in price, it still trades at a 21x forward P/E multiple compared to our implied purchase price of 5x P/E for similar assets at ECN. Assuming a 15x P/E multiple for the ECN services businesses and book value for the remaining aviation and retail leasing assets yields a price of C$6.80 per share compared to the quarter-end price of C$3.77 per share. Our biggest gainer for the quarter was HCA Inc (NYSE:HCA), the largest hospital operator in the United States. We acquired our position in HCA, at a very attractive price, in the third quarter of 2017 when the headlines were full of President Trump’s attempts to repeal and replace the Affordable Care Act introduced under the Obama Administration. HCA has already been a strong performer for the Fund, increasing in price by 75% from our purchase price of a year ago, to end the quarter at US$139.12 per share (up 36% for the quarter). Our investment thesis centered on investing in an industry leading company that had a strong and entrenched competitive position, the result of many years of clever strategic decisions and operational excellence, at a time when short term and headline driven concerns gave rise to a subdued price. The company is very capably run by a well aligned and shareholder friendly management team and, since our investment, has continued to deliver strong operational performance. Our second biggest gainer for the quarter was Spirit Airlines (NYSE:SAVE) which increased by 29% during the quarter to end at US$46.97 per share. Spirit’s share price struggled during the middle of the year as revenue per available seat mile (RASM) declined by 4.6% for the first half of the year at the same time as fuel costs increased causing concern over margins and profitability. The share price bottomed this year at $34.68 in April and has been recovering since. Over the past few years, the company has been working successfully to increase operational performance in important areas such as on-time performance, while maintaining very tight control of non-fuel costs. Spirit recently announced that RASM for 3Q was up 5.5%, which should be sufficient to cover recent increases in fuel costs, and the company continues to be unsurpassed in managing down cost per seat mile which declined by 3.5% (ex fuel) in the quarter. At quarter end, Spirit was valued at 11x forward earnings per share and we think the company is set up well to grow earnings per share nicely from here. Our third biggest gainer for the quarter was Motorcar Parts of America (NASDAQ:MPAA) which increased 25% to end the quarter at US$23.45 per share. Like Spirit, MPAA has struggled during the year with subdued operational performance. The company, as always, is lumped in with the OEM auto suppliers and has suffered from trade war fears and concerns over where we are in the auto cycle. MPAA’s sales, however, are not linked to new car sales and derive, instead, from repairs to cars already existing in the fleet. The size of the existing car fleet in the US continues to grow, now over 260 million cars, and continues to get older, now approaching 12 years old on average. The sweet spot for MPAA is cars over 8-11 years old. Given the material decline in new car sales in the financial crises of 2008-2009, cars in this age bracket saw a reduced ‘wave’ come through which we believe has led to some recent softness in business and to MPAA’s major retail customers initiating inventory reductions which has exacerbated the issue. We think these issues are starting to pass and MPAA has continued to gain market share during this period positioning the company well for growth. MPAA trades at an enterprise value of a little over 6x operating profit and, at these levels, we have been encouraging the company to accelerate its share buyback program. In a letter to the company in August of this year, we argued that the company could buyback approximately 15% of the outstanding share capital over the next three years while maintaining net debt to EBITDA at a prudent level of below 1.5x. Pleasingly, shortly after we sent our letter to the company, MPAA announced it was increasing its buyback authorization. Our biggest decliner for the quarter was General Motors (NYSE:GM), which declined by 14% to US$33.67 per share on rising fears of a trade war with China, increasing input/commodity costs and concerns over a softening new car market. During the period, GM released second quarter results which included a modest downgrade to expected full year earnings on the back of rising input/commodity costs and impacts from the ongoing transition to new model trucks. We believe our fundamental thesis on GM remains sound and recent company announcements increase our belief in the company’s prospects. Specifically, one element of optionality in the GM investment thesis is the Cruise autonomous vehicle division. GM has been devoting significant resources to developing truly autonomous vehicles that can be mass produced. These efforts have been building in credibility for some time now and were given further credibility when Softbank recently announced an investment of US$2.25 billion (staged over time) in GM Cruise Holdings for a stake of 19.6% (once fully invested). More recently, on 3rd October, GM announced that Honda would invest $750 million upfront in Cruise, with an additional $2 billion over 12 years to work with GM to develop a purpose-built autonomous vehicle for Cruise that can serve a wide range of end-uses. This investment gets Honda a 5.6% stake in Cruise and values Cruise at US$14.6 billion (compared to a total current GM market capitalization of $45 billion). Netting off the above value of Cruise means GM (ex-Cruise) is trading on an implied forward price-to-earnings multiple of roughly 4x. This ignores the potential upside value of Cruise and its, arguably, leading position in the race for an autonomous robo-taxi fleet that some sell side brokers have estimated could be worth over $30 billion itself. We have confidence in the underlying value in the companies in our portfolio and believe they are competitively well-positioned in their markets. They are also priced at attractive absolute levels with prices well below our estimates of underlying value offering us what we believe to be an attractive margin of safety. We believe that our value-oriented and concentrated investment approach will continue to generate good investment outcomes for our investors over time, and the team at Avenir remain energised and focused in our search for the next great investment.